The bad economy has been grueling to a lot of low or even mid income household, where many breadwinners lose their steady paychecks to retrenchments overnight. In such environment, most are strapped by tight budget, and on the search for bargain home decor solutions, like discount window treatments. And amongst these solutions are the very popular faux wood window blinds which are made of synthetic materials, usually combination of composite wood and plastic fibers and others. One key benefit of the fake wood is that the materials are made to be able to withstand moisture and humidity. This is a critical function as in the lower parts of the country our summers bring rather high humidity. This also explains why these shades are fast becoming the preferred choice by the humid countries like are Japan and the tropical south east asian countries too. Not only that, faux wood window blinds also have insulation capabilities and they are responsible for keeping in the warmth and keeping out the cold in winter. They function just as well in summer by doing just the opposite. This very function can literally help you save on lower utility bills as well. They are quite affordable to say the least and also very easy to maintain. Simply clean the slats with a damp cloth on a regular basis and they will look like new everyday of the week. Alternatively, if you are feeling a little lazy, you can use a dust buster and cut your cleaning time by half. Sometimes, it is rather difficult to differentiate between real and fake wood on some shades. They are made so real that homeowners use them even in their living rooms. 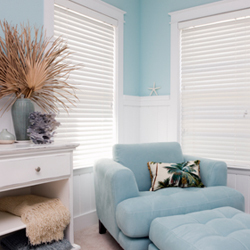 In fact, they can literally enhance the resale value of your home since faux wood window blinds tend to make your home look sophisticated and chic without the high cost.